In Shawn Hall's lyrics, women are either "girls" or "mamas." Or at least that's what was coming through in the selection of songs they played to open up the Main Stage on the Sunday night of the Regina Folk Festival. 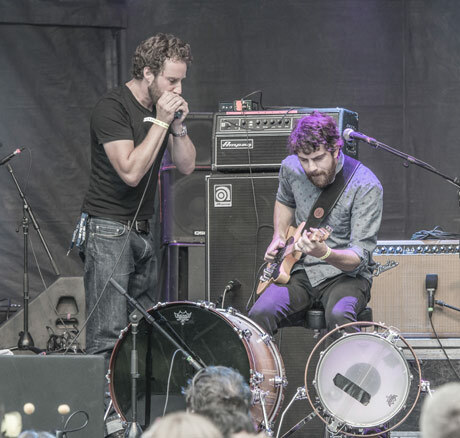 It's a blues trope, and Vancouver, BC's the Harpoonist & the Axe Murderer ran with it. Singer and harmonica player Hall and guitarist and percussionist Matthew Rogers don't shy away from coming off as scruffy nostalgists. Hall even mentioned, with a dose of irony, that things were better when one could smoke on planes by way of introducing "Don't Make 'Em Like They Used To," from their new album, A Real Fine Mess. But a band doesn't need to revolutionize a genre every time they take the stage, and with these two, the feeling wasn't as much in what was being said as how. Rogers, the classic silent sideman for most of the show, used his able fingers to lay out a solid guitar framework, while his feet steadily worked out the beat. He was working hard — you really hope he knows a good masseuse, given how much he puts into those performances. Hall was looser, working pedals, bluesy harmonica, and his own rough-hewn vocals from his own stool on the stage. A keys player added midway through the set was a welcome addition, too. Most of all, Hall's banter kept the crowd entertained between rowdy blues stompers, even if some of his topics of discussion — getting fired from CityTV, the bacchanalia that he heard is Winnipeg Folk Festival campgrounds — would've made better subjects for songs instead of an anonymous mama who needs to leave.